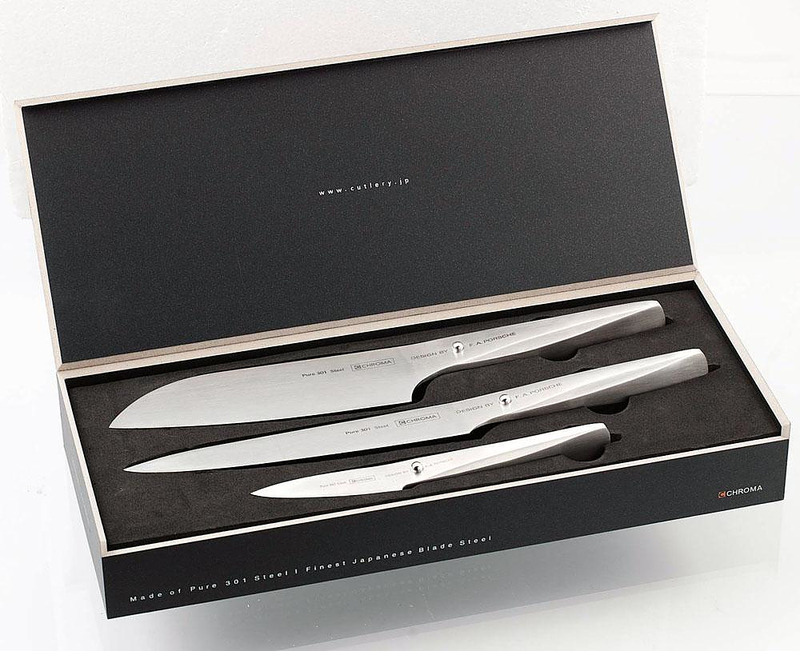 HomeBlogHome DecorChroma type 301 Knives, design by F.A. PORSCHE. 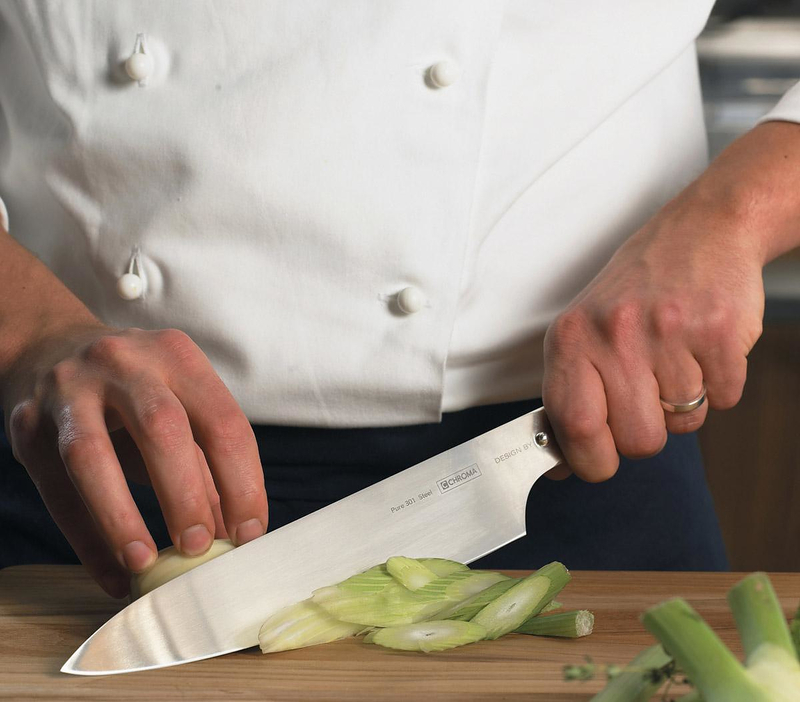 A sharp and ergonomic knife is perhaps the most important and certainly the most favorite tool of a Chef, regardless if he is a professional or a hobbyist. 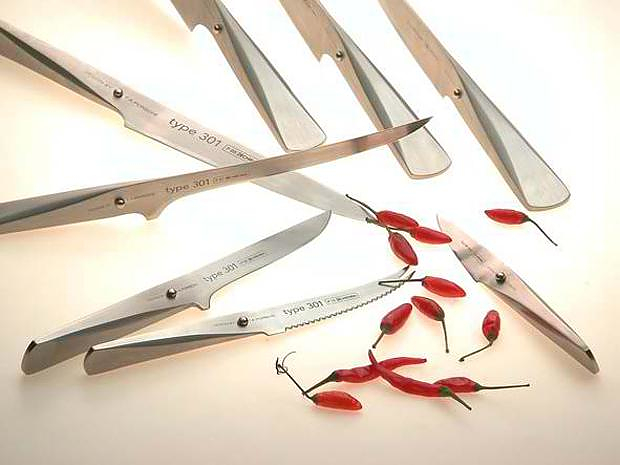 Japanese knives have achieved global recognition for their quality, as the Japanese hold a long tradition in metallurgy. The Japanese metallurgists have elevated the forging and sharpening of the blade into a form of art for hundreds of years, since the era of the notorious Katana swords. On the other hand, Europeans and Americans also make excellent knives, often characterized by superior ergonomics and design, but rarely distinguished for the hardness and sharpness of their blade. 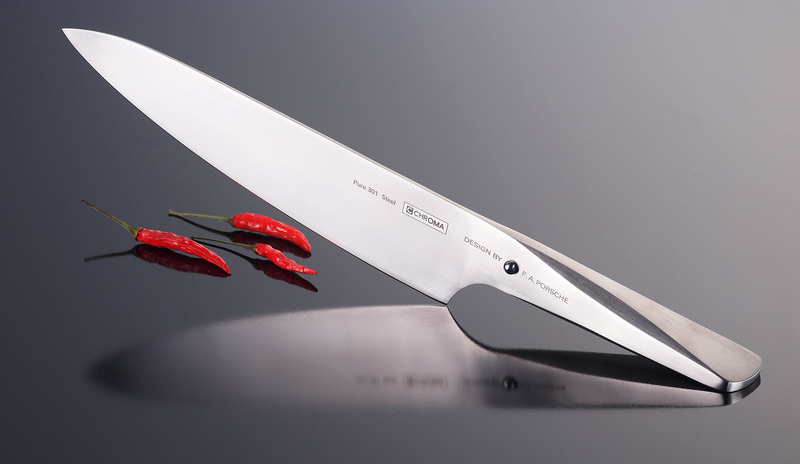 The type 301 knife series by Chroma bridges the gap between Japanese tradition and the European design. Chroma type 301 cutlery are designed by F.A. Porsche and they stand out for their unique design and their practical function. 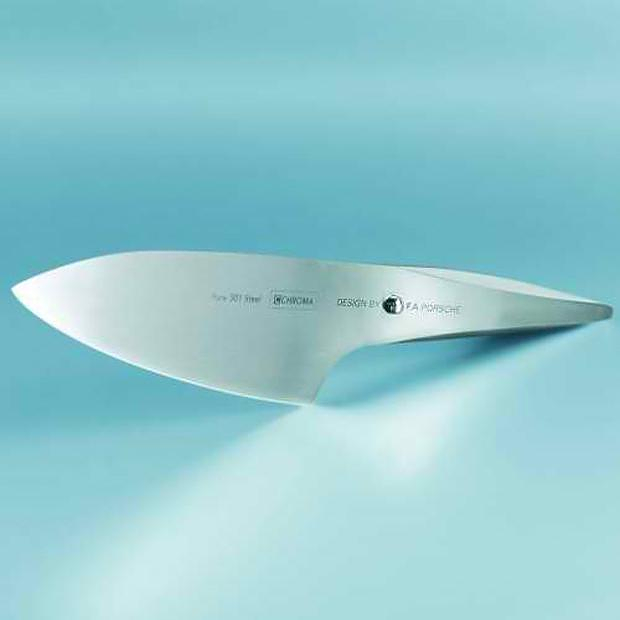 Porsche Design worked closely with chef of the decade, Jörg Wörther, in order to develop the final shape of the handle, which is optimized for maximum usability. The result is a precision cutting tool. Each knife is carefully weighted to ensure perfect balance in the hand and in combination with the highly ergonomic handle, it feels like an extension of the user’s hand. The Chroma type 301 knives follow faithfully the Japanese philosophy, which dictates a knife to be lightweight and flexible. They are made of high-quality Japanese 301 steel, a relatively lightweight material which has a 56-58 hardness rating in the Rockwell hardness scale. This renders the type 301 knives harder than most of the non-Japanese knives and among the hardest knives within their price range. 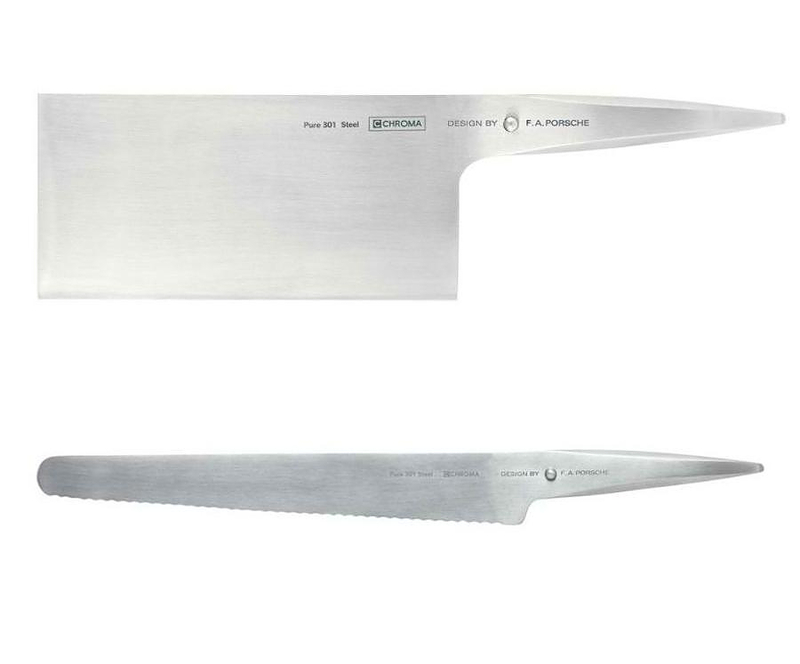 The increased hardness allows the knife to maintain its sharpness longer and also to slice better. Even though the Chroma type 301 knives are mass produced, they are carefully razorsharp sharpened by the hand of a master. Quality control is performed on one-to-one basis and not through random sampling. In addition, it is worth mentioning the following ergonomic innovations which make Chroma Type 301 stand out from the competition. – An ergonomic handle designed by F.A. 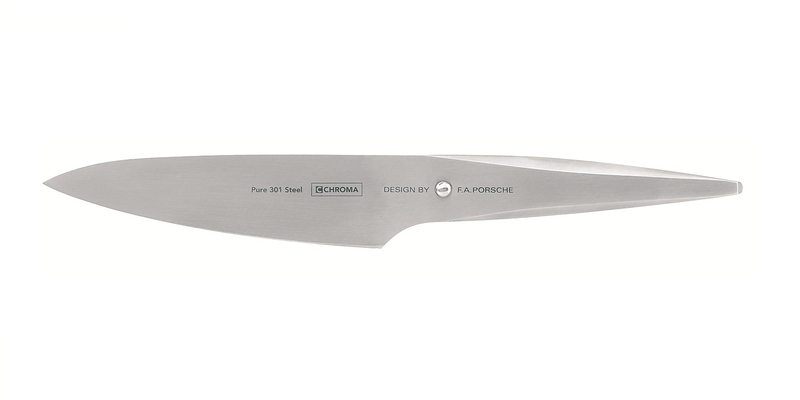 Porsche, which offers better control and allows the knife to stand upright without its blade touching the bench. – A metal “pearl” which clearly demarcates the end of the handle, for better control when cutting. – A seamless construction and hygienic transition from blade to handle. There are no pieces of different materials to fall apart, at the same time the knife is more hygienic in use since you can easily clean its smooth surface. 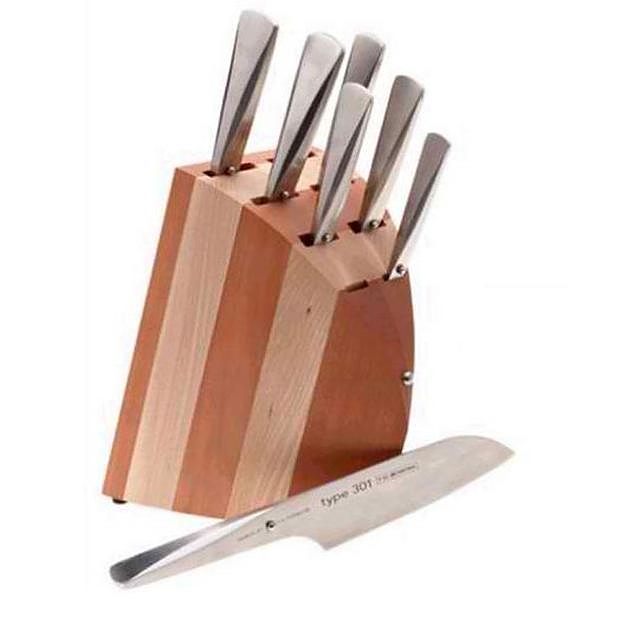 – A special grinding method is used, so the knife stays sharp longer and is easier to sharpen. – The out of the box sharpness is among best in the industry. However, since no knife will remain sharp forever, when the time comes to choose such a tool, the sharpening process is always an important factor to consider. 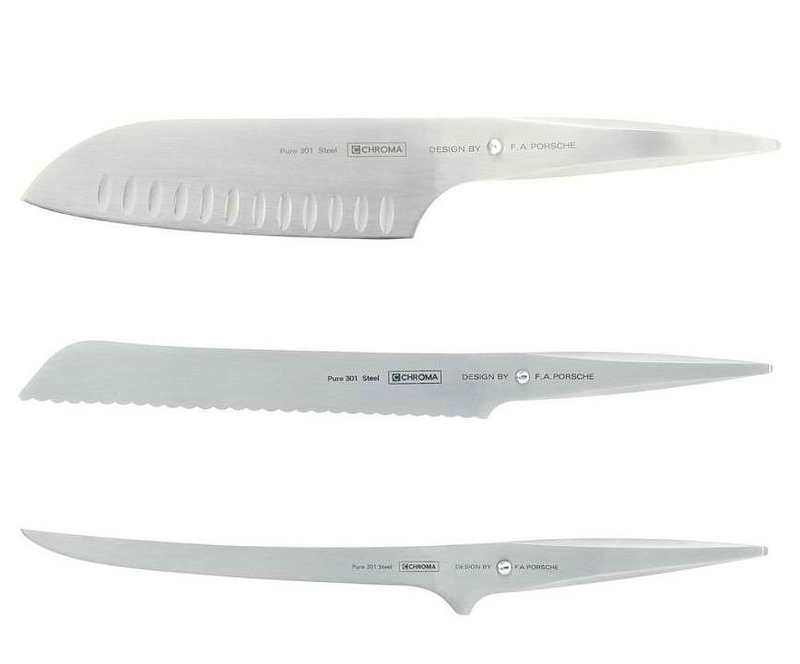 Chroma Type 301 knives, as most specialized chef knives, are not sharpened with the common metal sharpening rods. For this reason, Chroma offers special whetstones used to sharpen the type 301 knives. Ideally, the knife should be sharpened daily (for professional cooks) or about every six months (for hobby cooks), and by the same person each time. Each person has an individual angle and movement when he or she sharpens the knife. The blade of the knife becomes sharper each time it is sharpened in the same manner, by the same person. For the novice user there are available metal “guides” which place the knife on the correct angle against the whetstone. With the assistance of these “guides” sharpening with a 301 knife with the 301 whetstone becomes so simple that even beginners can quickly master the technique. Artistic French Dinner Knives by Henri Mazelier. Thank you for your comment dear Murat Gökmen. We don’t have a shop in Turkey, but you can order whatever you want from our e-shop and have it shipped to Turkey. Shipping to Turkey is also quite fast and reasonable.